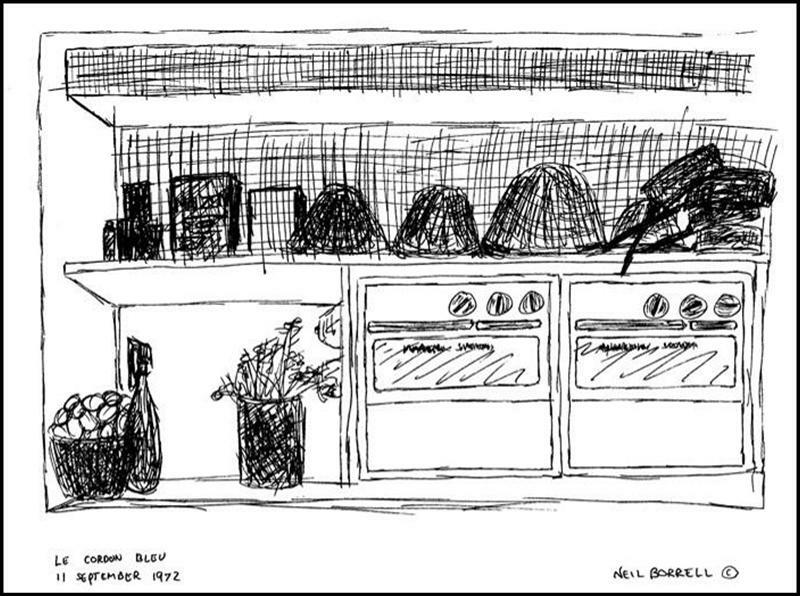 In 1972 I came up with the idea for a small scale, local New York restaurant and cooking show. Small broadcast cameras were very new, were not actually small at all, and were not easily available. My wife, Gerry, and I had worked with a producer who was now working with a guy who owned one of the small cameras, a Norelco PCP90. My plan was to get the camera, and the “portable” Ampex 3000 tape recorder that weighed a ton, and shoot the show one day a week. We would go to two New York restaurants each week and shoot one segment in the front of the house as an interview with the owner. We would move into the kitchen for segment two and show one recipe with the chef. One day a week, two restaurants and two recipes, not a terribly expensive production and it had possibilities. In 1972 this was groundbreaking stuff. I went to the producer with this idea and within one day it blossomed from a small scale low-budget show to an epic travel and cooking production that would be shot in Europe and allow us to spend three months a year surveying locations and three months a year shooting. For the next six months I spent three hours a day in this guy’s office working on proposals for what we were calling “The Spice of Life” and then I would go to my regular job at Channel 9. The concept got so grandiose that it never happened; we couldn’t find anyone willing to spend the kind of money it would take to do this extravaganza. 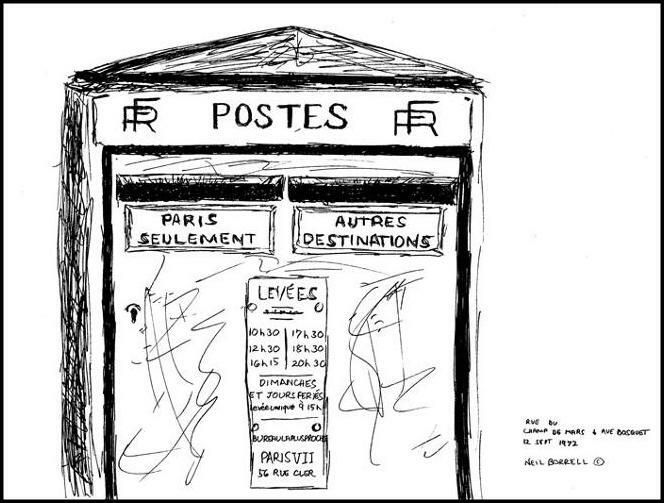 Gerry and I had planned a trip to France and England that Fall and decided to scout locations. We started out taking an afternoon class at the famous Paris cooking school, Le Cordon Bleu, where we wanted to shoot at least one segment. Since it’s in Paris they teach in French, which I don’t speak, but I planned on taking photographs to show where we would set up to shoot. Gerry speaks French so she was able to translate the part where they insisted that photography was forbidden. I had a bad cold and had lost my sense of taste, so now I wouldn’t be able to understand the class, wouldn’t be able to photograph the school, and wouldn’t be able to taste the food that was made. I loved to draw. 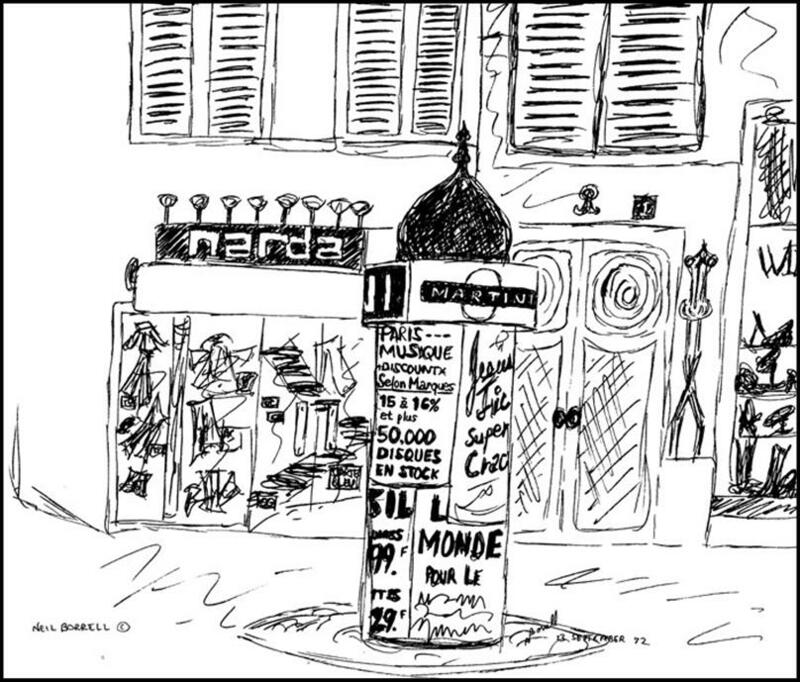 Although I thought of myself as a cartoonist, I decided to sketch out the shots. I discovered that I could draw from reality. It was incredibly exciting for me to see the way the sketches ended up. 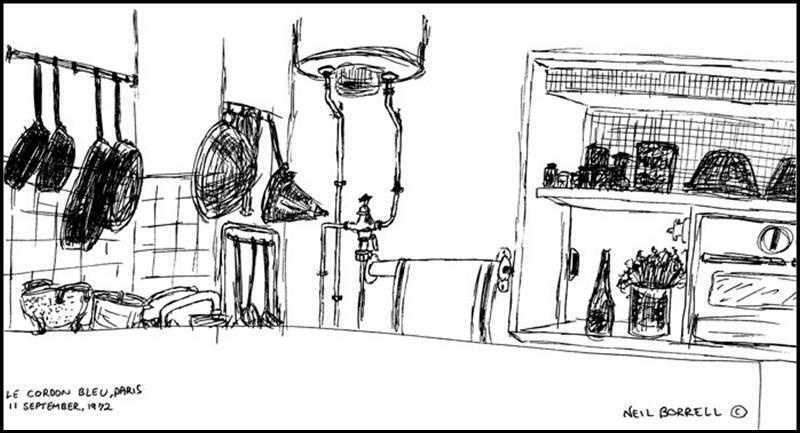 I did two drawings and remember really liking the pans hanging on the wall. I bought a pad and some felt tipped pens and started drawing every time we sat down at a sidewalk café. 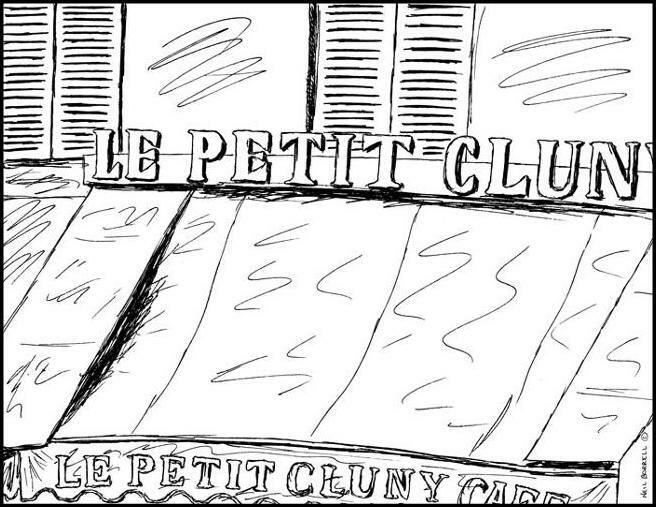 My favorite drawing was done at Le Petit Cluny Café on the ground floor of the building of our little hotel on Blvd. St. Michelle. 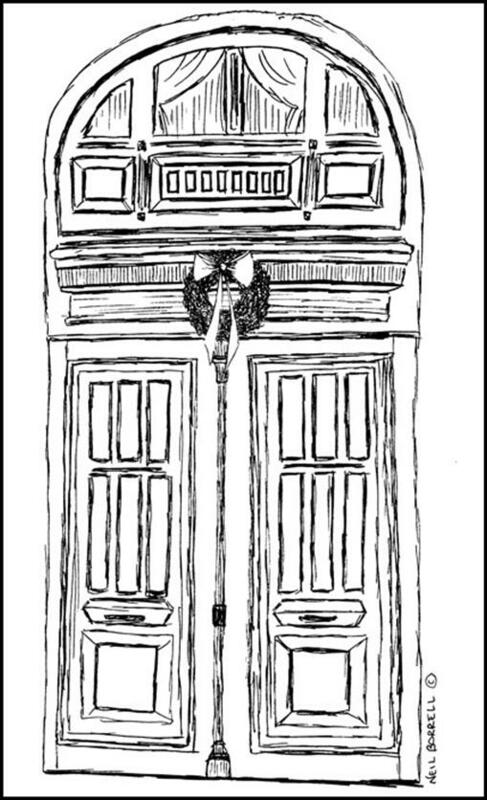 The drawing is of a large doorway across the street. It became our first annual Christmas Card. I wanted to add a holiday touch to the drawing so I drew a wreath and pasted it over the door. Since then I’ve decided that the drawings aren’t so much holiday cards as they are holiday gifts that don’t need touching up.